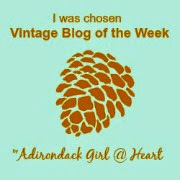 Yippee, I can comment on your blog now!! Love the purple, what a refreshing change for a Valentine dinner. I adore those vintage salad plates!! Thanks, Liz. Mother Nature is teasing us this week, and my yard pansies are raising their faces in delight (I am too!). I am in love with this table because of so many different reasons. Oh my word! Gorgeous color and texture plus those chargers and napkin rings and to send me over the edge...The flatware, looks like jewelry. Gorgeous table Rita! Thanks, Christine. I definitely had you (and my mom) on my mind as I created this table, knowing your love of purple and even the gray. Thank you, Ann. I think the creative highway runs both ways, with inspiration delivered and received from each other! Thanks, Mary. I'm also amazed at how these fine things can last, and how even the plants survive from the deep freezes, but it definitely is what keeps our interest in searching them out. Ditto on enjoying styling alongside you this week. You do such amazing work! Rita, I would love to have a seat at your table! So clever and beautiful your use of purple and tablescape name. In particular, I adore those glass chargers --- did I miss who makes them or were they one of your amazing finds? My eye also goes right to the vintage biscuit box and fresh flower centerpiece. Gorgeous. Oops, Debbee, I had left out the source for the chargers (now fixed). They were from Pier 1. Thanks for the catch. This is stunning Rita, and so different! The purple palette is romantic, and wow, those glass chargers are gorgeous! The pansy looks wonderful in the silver box, you have created a truly magical scene! I came back and saw my "face" again..so the comment is working for me!..Yay!...OK...so I must say that your table of Purple Passion is on fire...it has such a regal and romantic look to it and the compliment of silver is perfection...I so love that you chose this color as it is one of my favorites...and what a great find on those exquisite French salad plates...they are gorgeous! Beautiful table Rita and may you have a most beautiful day! Rita, I always love your narrative, I learn so much from you. 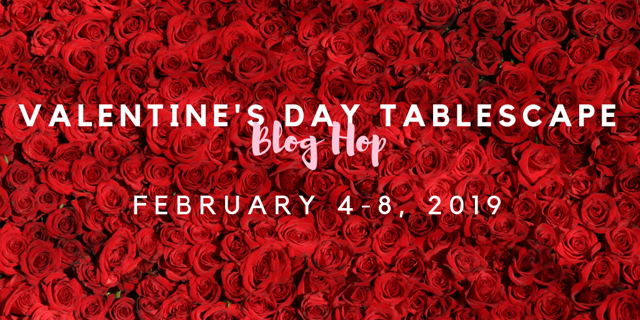 Your table is so pretty and the colors are perfect for celebrating Valentine's Day no matter who the guests are. We know purple is for Royalty and I would be honored to be sitting at your table, though Royalty I am not. LOL . Perhaps my red hair would provide the fire to match your fire and ice. Wow! Purple Passion conjures up such beautiful romantic thoughts in my ever the romantic dreams. 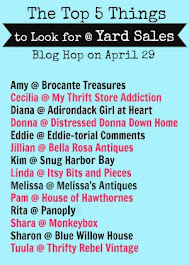 Good job at this blog hop, as usual my dear friend. Oh the elegance of purple! Rita, your tablescape emits passion and affection. It certainly has the lovely touch of a woman in love. I love your ice chargers. The contrast of fire and ice really stirs the senses. Beautiful for anytime and especially at Valentine's Day. Ditto, Cecilia. It's always a pleasure being in your blog company. Thank you for your comment. So lovely and elegant, Rita! Your tablescapes are so thoughtfully designed, with every detail contributing to a gorgeous display. 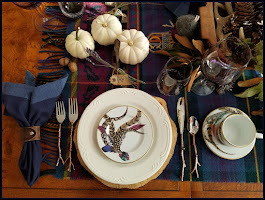 Details, like the napkin rings, charger edges and crackled glassware, so often take the table one step further. I'm partial to the silverplated birds (since I have them as well!) but the transferware plates are wonderful. Thanks for the inspiration! Sandra, thank you so much! I really appreciate your comments. I consider your talents in tablescaping extremely creative. Rita, everything on that table is absolutely exquisite! I love the colors you chose and everything is so well designed! 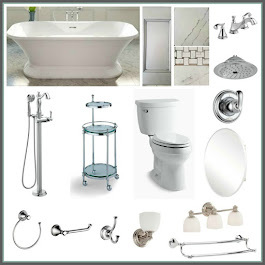 I love the centerpiece...silver always makes a statement and to me, just finishes everything off so perfectly! Gorgeous, my friend! Love and hugs! 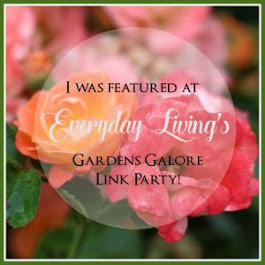 I wanted to let you know that you are being featured this week at the Celebrate Your Story link party! You gorgeous table setting was the most clicked on link! :-) Love and hugs! That's great, Benita, thank you! Rita, Lovely, lovely, lovely! The centerpiece is perfect, as it the entire table. 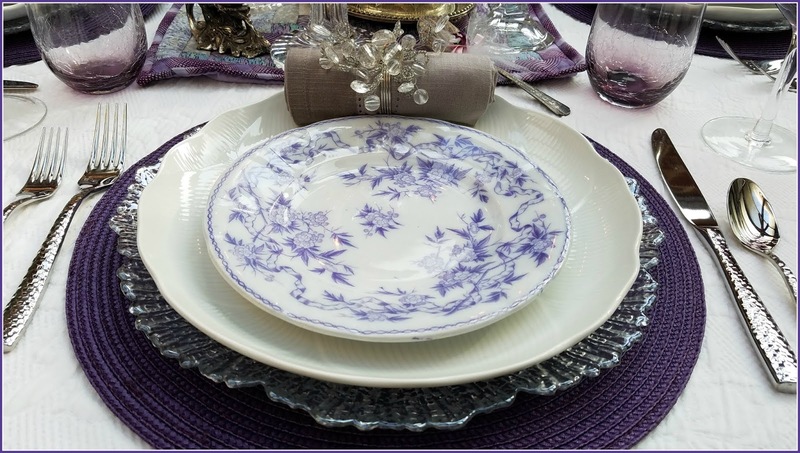 I so love your lavender transferware plates. And the candlesticks of varying heights add so much to the table. Love the overhead shot of the table, you can truly see how pretty everything is. Happy day and week to you, Rita! Sandra, thank you for your visit and nice remarks. I appreciate ya! You don't see many Valentine's table or decor in the color purple and this is a welcome change of pace. Your descriptions read like poetry and it's always a delight to visit you. Beautiful styling! What nice things you say, Sandra. I'm flattered, thank you so much! Thank you, Pam. Pansies work this far north too! Mine are doing great, even after the deep freezes. I plant them in fall, and they'll carry on until late spring. Thanks for your visit! Rita, I love your table. 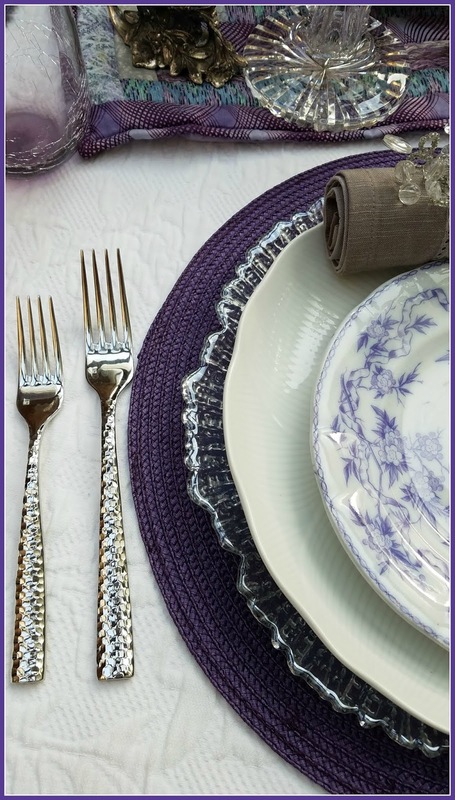 Your purple transferware was a great find and it looks so nice on your plate stack. I adore the pansies in the silver biscuit box and your collection of crystal candlesticks. I'm also loving the fabric pattern under your centerpiece. I always enjoy your commentary and love your overhead shot of your table. This is the first I have read about Google + going away! That's a bummer for many people. Your post did not show up in my email so that's why I'm late to the party. I had not seen a schedule yet. Bonnie, thank you, friend, for taking the time to be so thoughtful in your comments. So far, it seems the Google+ thing is not so bad. In fact, I'm getting notices of comments (which had stopped working with G+ more than a year ago). Hopefully you won't see any differences either. Have a great week. Oh, Rita, how lovely your purple and white table is! Your theme of fire and ice is evident in every image I see, those impressive chargers looking like they were cut from a frozen lake. The shimmer of your flatware and the sparkle of the napkin rings all express your theme so wonderfully. 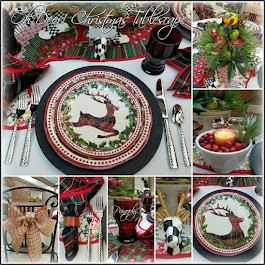 Thank you so much for joining in another tablescape blog hop and sharing your table styling talents! Chloe, thank YOU for always be consistently organized, patient, and inspirational. You keep me on my toes! Rita, loving your purple passion and ice tablescape. Those chargers are lovely. Who says Valentine is just red or pink? The transferware is gorgeous. The pansy looks so pretty centerstage. The staggered heights of the candles is so romantic. 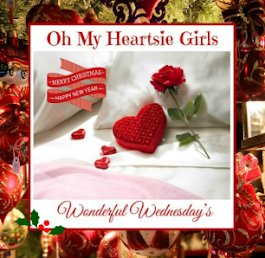 Always a pleasure to join you on these blog hops. I agree, Linda. Who says Valentine is just red or pink, or just for couples, right? I love all the ideas being shared among us. Rita you tables are always the BEST! 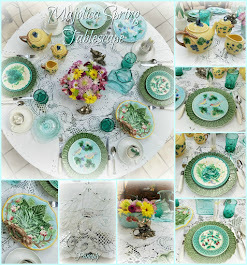 I love this color theme, those transfer salad plates, the sweet bird salt and pepper shakers and the Vintage spoons.... all are just beautiful. Aww, Tammy, thank you so much. I appreciate your comment. This is super pretty, Rita. I really love the deep purple with the icy feel. And the dishes are especially beautiful. I so enjoy your tables! Thank you, Jeanie.I enjoy creating these tables, so it's always welcome to hear readers enjoy them too. Rita, you certainly delivered on the inspiration as stated in your opening. 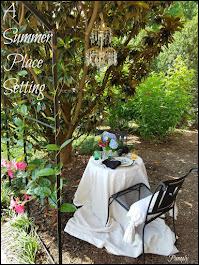 This is a stunning setting and will be perfect to share with anyone. I love your table compared to a cold winter's day, perfectly I might add. I love each piece of the stack. The glass chargers are incredible and they do look like ice! The simple clean look of the while plate and those beautiful transferware plates. Your tablescapes are always stunning. Emily, thank you. As I am purging items in my dish closet, I am finding the simple clean based are what I crave keeping, mixing things up with things like salads and napkins/rings. It's a good feeling! Beautiful tablescape. I love the shades of purple you picked for your design. Purple is my favorite color and I'm LOVING how it's used in this tablescape! 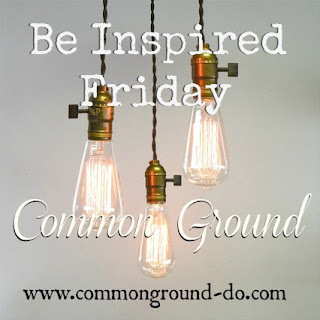 I found your blog through the Celebrate Your Story link party! 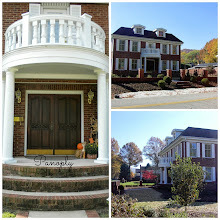 Thank you, Kay, and welcome to my blog! My mother loved purple too, and I always associate it with her, so this made my heart smile how it turned out. 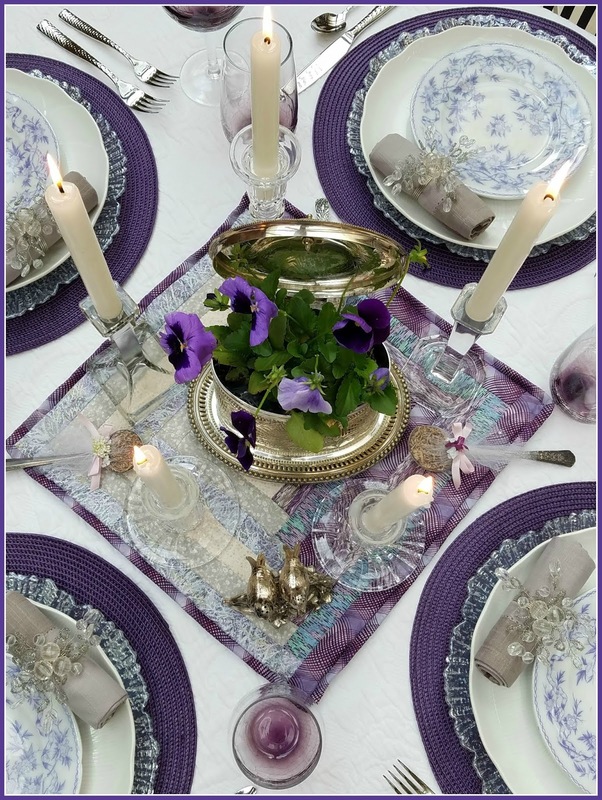 What a beautiful purple hued table, Rita! Those vintage salad plates are such beauties, and the glass chargers do remind one of ice. The varying candles look so pretty and so interesting with the different heights. Planting the pansy in the biscuit box made for such a lovely centerpiece. I'd be happy to be a galentine at your table! Thanks, Kitty. I would so enjoy your company at my Galentine's, anc Cissy too! Rita, this is exquisite! I love the regal feel of purple. It makes a marvelous statement for a valentine's table. The plate stack with the antique French salads, your linens, flickering candlelight, and the lovely silver biscuit box are all details that reflect love. Wish I were one of the four joining at this table. Perfection! Thank you, Sarah. Your company would always be welcome at my table! Thank you, Diana. The pansy is such a sweet flower, and the Victorian language of flowers is truly a treasure from the past. 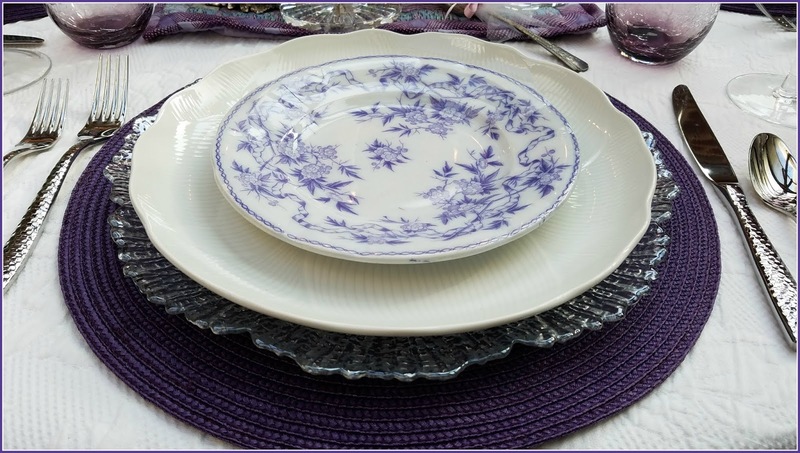 Rita C., the purple and white dishes are beautiful and what a great way to use purple pansies. Using the biscuit box to hold them was a smart idea. Love all the linens for a vintage look. As always, a lovely setting. Rita, purple is my favorite. We have TOO much ice and snow in Maine despite a warm day and those pansies made me homesick for spring. Your table is just gorgeous! Aww, Kathy, with this warming trend this week, it won't be long before those pansies show their sweet faces in Maine too (even though we are diving back into winter again this weekend). Thanks so much for your visit and comment. Hello Rita and Happy Pre-Valentine's Day! 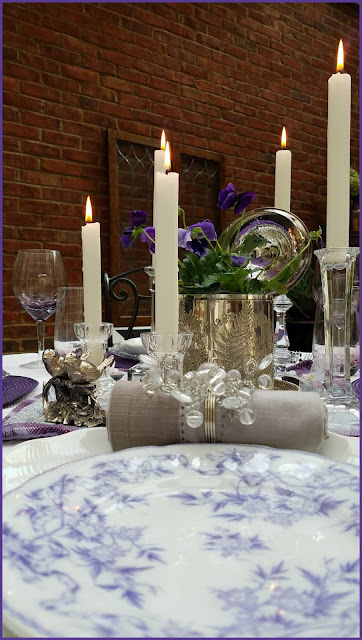 Such a beautiful table and so refreshing with the soft Lavender motif and plates. I love the sweet faces of pansies and how you nestled them in silver! Hi Jemma! Thanks for visiting. I have those pansies in my annual beds right now, and they go back and forth between napping in the bitter cold temps and showing their sweet faces when the temps rise like they have this week. They'll be back asleep come the weekend, when we dive back into winter. Happy Valentine's to you! Gorgeous, Rita!! I adore purple, and I'm so envious that you have pansies! I actually ordered seeds this year to try my hand and starting them indoors since it seems sooooo late every year that I can finally get pansies, and I usually have to drive off the mountain to get them! Debbie, you are a gardener in the purest form! Starting your plants from seeds is truly the most satisfying and rewarding of all types of plantings. 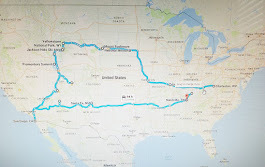 Do tell of your journey with the pansies on your blog! Thanks for the visit! Oh Rita, this table is absolutely gorgeous! The rich purple color is perfect. 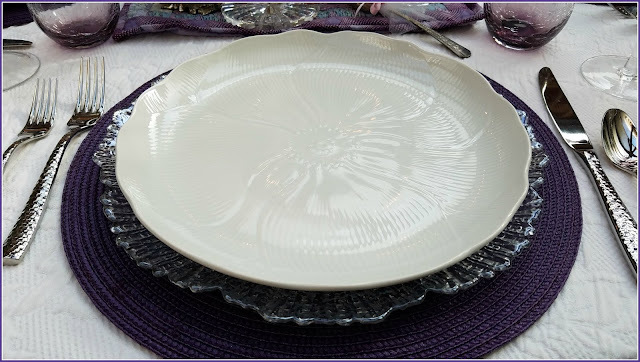 I adore those glass charger plates and sweet purple transfware plates...so pretty. The pansies and glow of candlelight make the perfect finishing touch. Everything looks gorgeous! Happy Valentine's Day!!! Thank you, Shannon. Happy Valentine's Day to you too! 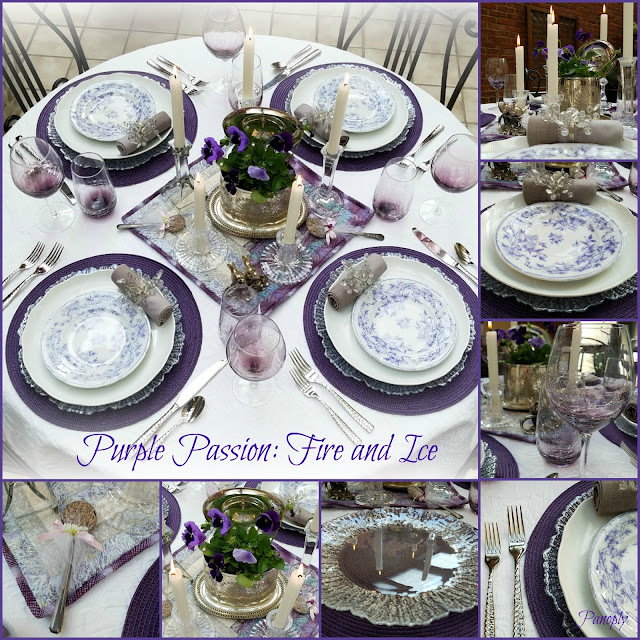 Gorgeous Purple Passion Fire & Ice Tablescape! i would be thrilled to me one of your Galentine's Guest! Thank you for this inspiring tablescape! Thank you for visiting, Pat! By all means, be my Galentine guest! This has me wanting to buy purple dishes. The dishes are so pretty and you created a gorgeous table. Carol, I know, right?! I simply could not resist these plates. Thank you! Never thought to use purple but I think it's fantastical! Love the entire table. Beautiful! What a pretty table = love the color scheme, especially because it is so unique! I know I would enjoy lunching and chatting at this table!! Thanks, Patti. 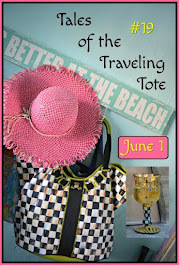 Think of me while you're lunching in the tropics! So pretty in purples! Beautiful job, Rita! Rita, such a beautiful table! Purple of any shade is my favorite color! Pairing it with the gray is perfect! I love the Transferware plates. So pretty! Thank you, Maureen. My mother always wore purple so well, and her silver gray hair always looked so pretty with it. As always you have creating a visually stunning post filled with literary delights as well! The pansies are so sweet! A few of mine are still alive outdoors in my late fall arrangements. I Victorian times and learning little tidbits of info like you shared here today. Your unique use of purple is just gorgeous and the whole setting is so creative! So happy to join you on the hop this week. Have a Happy Valentine's Day! Thank you, Amber. We would've both loved the Victorian era, with our propensity for all the stuff they gathered and used for everything under the sun! This has been a really inspiring post for me! 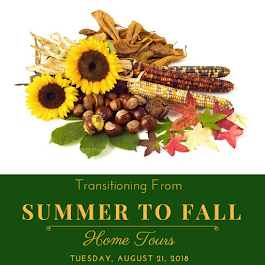 I was only thinking about how I am ready to get rid of the reds in the house and introduce a new colour, and I was thinking about hues of blue and lavender but I wasn't quite sure where to go with it. Although I can't do this in my dining room due to the wallpaper - the colours, the pansy, the lavender I may just copy in my sitting room! Or move my dining table into the conservatory where I can do a similar table scape. Just lovely! Thank you, Joanne! Have a wonderful Valentine's celebration with your loves! 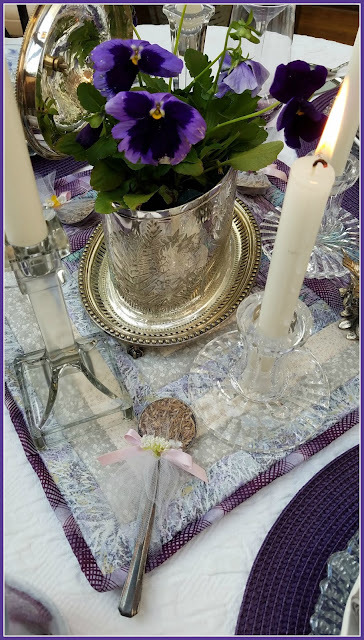 Your table is so pretty and elegant!Delicate and romantic in purple...Love the sweet centerpiece with Pansies.I am glad I can comment in your blog again.Hugs! Thank you! 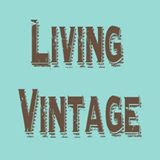 Welcome to my blog, it's lovely to make your acquaintance! Hi,Rita! Wow...that whole Google thing took everybody by surprise! What an unwelcome mess!!! ALL past comments just...gone!!! Your purple passion is fabulous! Purple is such a gorgeous color, and it perks us all right up this time of year when our world is filled with gloomy skies and generally icky weather. You did a great job with this tablescape! Happy Valentines Day!!! Thank you, Alycia, and so good to hear from you! Yea, there was a way to save all the comments but oh well....good friends last way longer than do any of the comments from the past. They can't take that away from us! This is such a beautiful tablescape! I love the shades of purple! I love the pansies in the silver biscuit box, too. Your table is perfect for Galentines dinner! BTW has Google announced that they're replacing Google+ with something else? No, I don't think Google has plans to replace G+ (it was an attempted fail at competing with FB). I have heard rumors that they plan to invest more with the functionality of Blogger, though, and that should be good for those of us still using it. Rita, this is an absolutely gorgeous tablescape! I love all the shades of lavender...such a beautiful idea for Valentine's Day! The vintage transferware is stunning. The pansies are such a lovely touch! Thank you, Lynne! I hope you have a great week! So lovely, Rita! I love purple, this year particularly: I think it will be my favourite for incoming spring! Thank you, Donna! I love purple and yellow in spring - pansies and daffodils! A beautiful table! The embellished soup spoons are an extra special touch, and the purple and silver combination is just gorgeous! Janet, thanks so much for stopping by my blog and leaving your comment! It's a pleasure having you here. Rita, what a beautiful table! I especially love your glass chargers - they really do remind me of puddles with icey edges - and I am smitten with your purple transferware. So fun hopping with you, as always! Happy Valentine's Day! Kim, thank you! Happy Valentine's / Galentine's Day! Rita, I saw this when it was first published and then everything went downhill from there, weatherwise. Anyways, not only do I really love your title, but this tablescape is one of my favorites of yours. 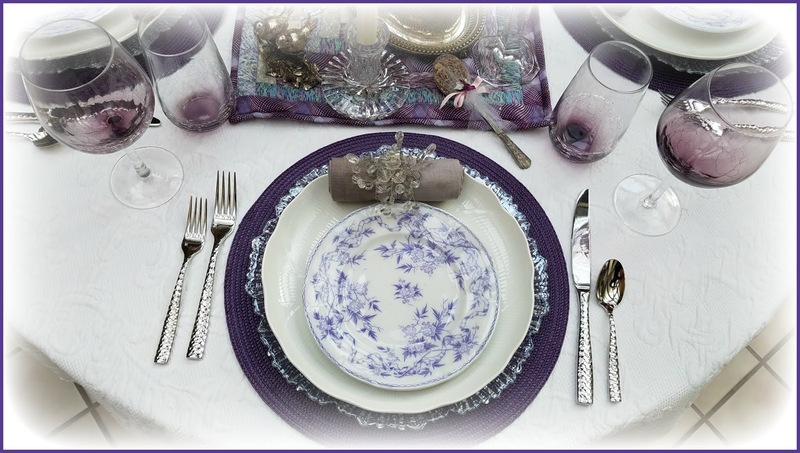 The purple transferware is stunning. Carol, thank you so much for taking the time, circling back, and leaving your warm comment. Here's hoping your week is filled with all things which warm your ♥! This is sooooo pretty. I think this is one of my new faves of your table scapes. Just gorgeous. I have never seen purple transfer ware. So pretty. Happy New Week. Kris, thank you so much! I had never seen such a pretty shade of purple in transferware either, so I fell hard. Can't keep doing that, that's for sure! Here's hoping you feel lots of love this week and always. Dear Rita! 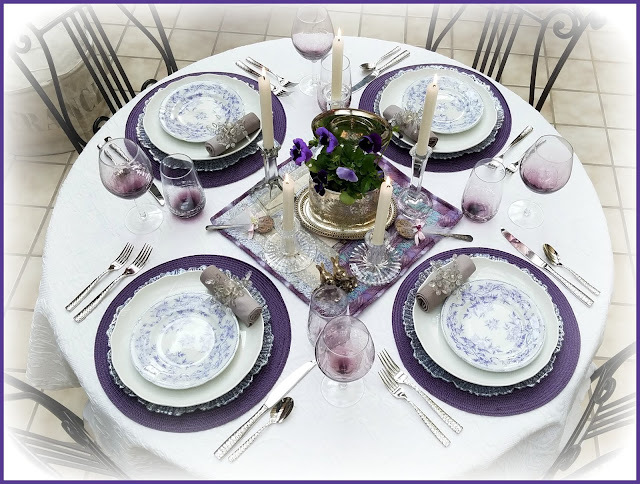 Your ´Purple Passion : fire and ice’ table setting is a lovely piece of artwork! Not only is it stunningly beautiful but your words are music to my ears! Matelassé is one of my favorite fabric and a tablecloth made from it would be welcome to my collection for sure! Pansies bring to mind such fond memories and your chargers make me think of my beloved Mother who adored having dinner parties and did so with both charm and ease. Lucy, thank you so much for visiting and leaving your comments! I love 'meeting' newcomers like you. I typically post a little more often than how I've started 2019 (this was my first post! ), but there's a good reason, which I will share soon on the blog. I hope you'll return. I appreciate your warm comments. Wow! 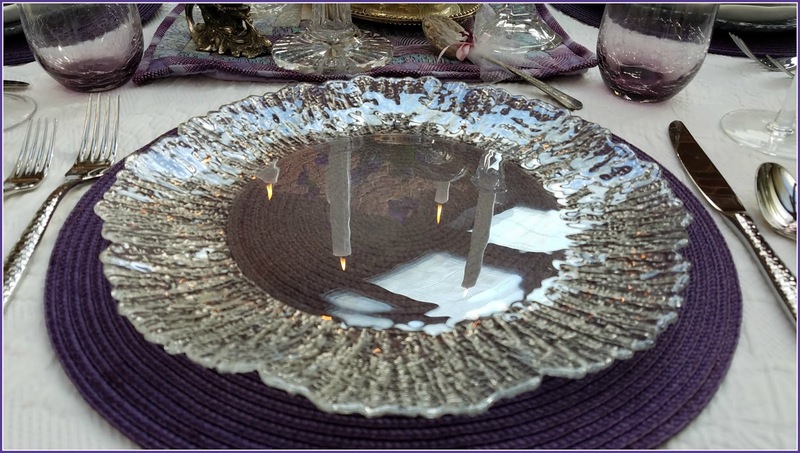 Your Purple Passion table setting is absolutely gorgeous! You have such an amazing eye for color and are so creative and talented! Thanks, Lee. With garden colors, it's hard to go wrong! What an absolutely breathtaking tablescape. Purple is so lovely and elegant. Have a wonderful weekend! Oooh -- I love those chargers, it's such a shame to cover them up. Then again, those purple transfer ware plates are beautiful. I think the purple must be rare because I hardly ever see it. 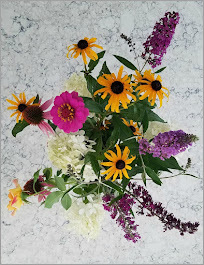 And I love how different flowers spoke of different feelings -- the Victorian language of love. Just lovely Rita! Thank you, Deborah. I think the purple is a little more obscure, so when I saw those plates, I fell hard. I'm glad others enjoyed them too. Rita I am late to the party but none the less in love with your purple passion table! Everything about it, the transfer ware, the pansies in that beautiful silver container, the love you put into designing this table is perfection!! Lidy, thank you so much. The purple struck a chord with me on several levels too. Fantastic post, very informative. I wonder why the other specialists of this sector do not notice this. You must continue your writing. I'm confident, you have a great readers' base already! .